A tenth century Arab king once said that the Vikings would “go to any length to get hold of coloured beads”. Beads of all varieties have been connected to the ancient Scandinavians, and one style of ornamentation in particular – the treasure necklace. Beads were so difficult to make that beaded ornamentation was highly valued and objects were passed from generation to generation. There is a necklace that originated from a 9th century hoard from Hon in Norway, that has inspired bead makers from around the world. Most such hoards or caches were either deposited temporarily with the intention the owner retrieve them later, or deposited as a permanent abandonment as part of a ritual. Hoards are rarely dug up by archaeologists. Instead, most have been discovered by accident during road building, farming, or the turmoil of war. The Hon cache contents were entirely gold, except for the necklace. The necklace has been dubbed the Hon Treasure necklace. It’s constructed of beads made of simple coloured glass, millefiori, flame-worked combed beads, foiled glass bead beads. It also had semi-precious stones with trailed decorations or pendants. The Hon treasure necklace has circular pendants made of one or more white beads strung on circles of intricate wire, coloured glass, and a golden Arabic coin plus seven gold book mounts. Larger beads are used as “dividers”, with smaller beads strung between. One of the unique things about the style of treasure necklace is one must dismiss any modern concepts of form, colour and symmetry. 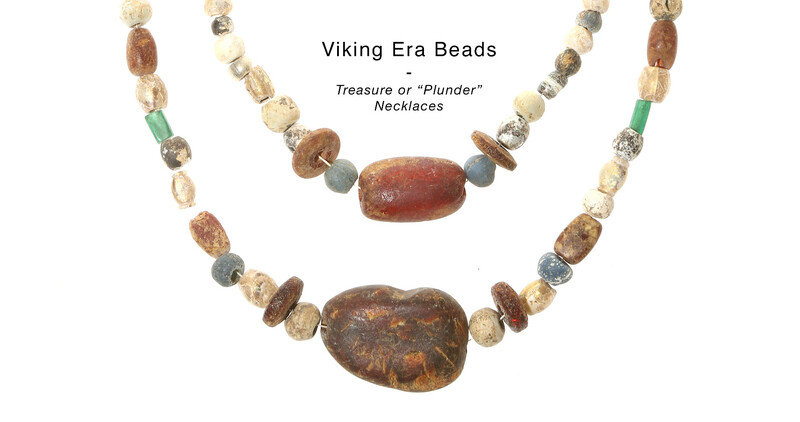 The Vikings valued a mashup of colours and collected many types of beads and items converted to serve as pendants. The beads are matched in pairs and clusters of complimentary size, shape and colour instead of being strung symmetrically and an equal distance apart from the centre point of focus. Archeologists have re-worked the necklace, rendering it historically accurate by attaching some gold filigree beads that had originally been left separate from the necklace.